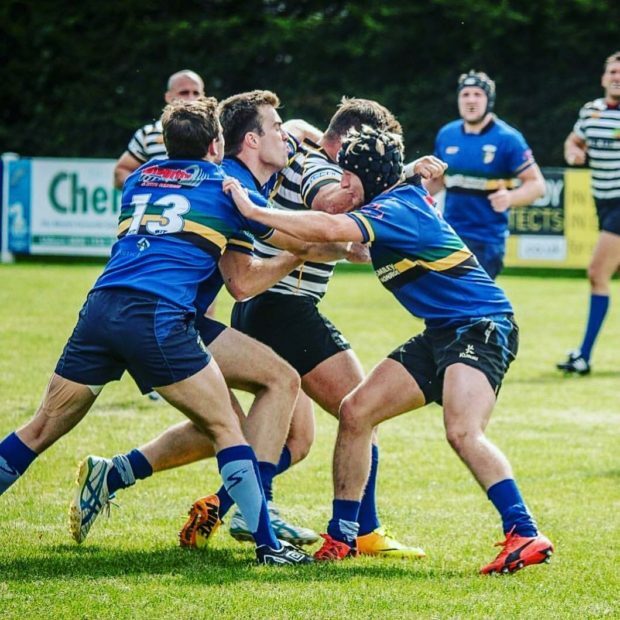 CI started their Kukri Qualifying League 2 campaign on Saturday with an away trip to Lisburn. After last weeks Lockington trophy victory against Dundalk there was an air of nervous anticipation at what could be produced by the visiting side. CI lined up in their new revamped black and white hooped jerseys with yellow piping. CI started well controlling possession. The first serious attacking threat came from a break by Will Herron, but CI were unable to make best use of a 3 on 1 and the pass went to ground, much to the frustration of the coaching team. Shortly after, Will Herron was first to score, this time ignoring his support to barge over for the score himself. CI dominated possession with Lisburn finding it difficult to escape their own half. An excellent move involving two quick rucks saw Andy Hodgen stroll in unopposed on the left. The highlight of the first half was arguably a try by Pete Raine who used his halfpenny-like positioning to gather and return a Lisburn clearance kick and then won an extended foot race to touch down. The crowd favourite Ross Hackney burst through to spare his blushes and secure the bonus point for CI minutes after a horrendous knock-on has roused the touch line rabble. Apart from one Lisburn surge into the CI 22, the flood gates opened in the second half, with a second for hackney, one for Bailey, one for Acheson and a few too many more to accurately remember as CI broke repeatedly from the kick off for full length scores. We were happy with the scores but more impressed with the hunger we showed to a clean sheet. Plenty for us to work on but and important first step of the season. Next up for CI is an away trip to Academy.